We're wrapping up our #milanogram2017 updates with a roundup of the most-shared installations and exhibitions from this year's Milan design week, including a pink outdoor bed and Nendo's jellyfish-like vases. Franco-Italian designer Marc Ange's Le Refuge bed was one of the most recognisable objects on our #milanogram2017 hashtag this year, offering sanctuary from the hustle and bustle of the city. Japanese designer Tokujin Yoshioka's huge installation for electronics brand LG was awarded the Milano Design Award 2017, but also won over Instagram users with a glowing wall that gently pulsates. This display by Spanish designer Arturo Álvarez was designed to evoke emotions, and was one of the most talked-about things on show at the Euroluce lighting fair this year. Visitors to Studio Swine's tree-like installation for COS have uploaded images of themselves interacting with the sculpture's bubbles, which burst into clouds of white mist when touched. Although not strictly created for Milan design week, an oversized pink face modelled on Pinocchio greeted visitors to the city's La Triennale museum. It formed the entrance to the Design for Children exhibition. British designer Lee Broom filled a carousel with products he designed over the past decade to celebrate his studio's 10th birthday. The Time Machine installation was located at Ventura Centrale, an exhibition space at the central train station. Fashion brand Louis Vuitton expanded its Objets Nomades homeware for Milan this year, exhibiting the collection in a neoclassical Milanese palace. But visitors were more interested by what they found at the entrance: a bright yellow Futuro, a prefab house from the 1960s. The highlight of Japanese studio Nendo's Invisible Outlines exhibition at Jil Sander was an aquarium featuring 30 submerged silicone vases that gently swayed like jellyfish. Jaime Hayon's whimsical Stone Age Folk exhibition was installed inside a Milanese palace. The Spanish designer used Caesarstone quartz, metal and stained glass to create a series of large translucent faces, and encouraged visitors to take selfies beside them. Comprising 1,670 terracotta blocks stacked in three tiers, SHoP Architects' Wave/Cave installation took place as part of Interni Magazine's Material Immaterial exhibition. 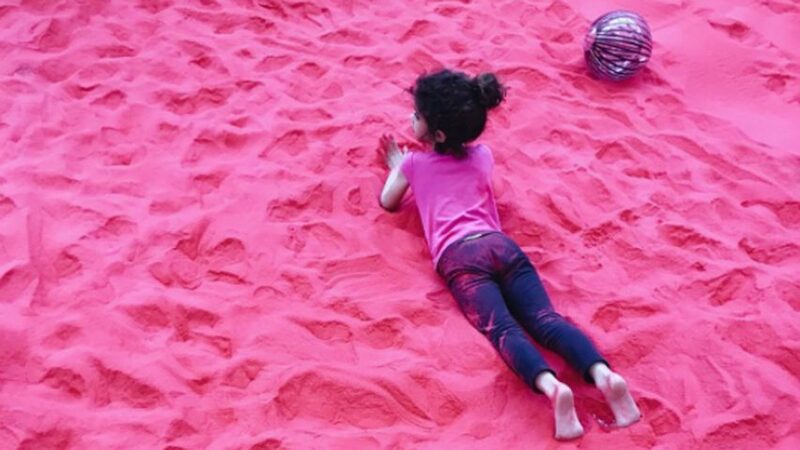 The kid's choice was fashion label Marni's playground exhibition filled with brightly coloured sand, furniture and childhood toys.